SelTrak is a market leading provider of a range of quality fleet tracking systems and asset tracking products including European web based tracking, Pc based tracking, Driver ID tags, Asset Tags, Temperature Tags and job despatch. They use a GPS and GPRS technology to provide accurate, low cost fleet tracking solutions. 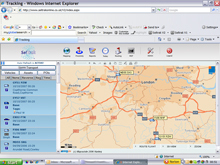 The SelTrak system is totally web based, this gives the customer the ability to control and monitor their vehicles from any pc without the need for special software. This simple to use system will not only save time and resources but should increase productivity and profits. Get in touch with us for information on fleet tracking and SelTrak products – our experts are glad to help. Our network of engineers allows us to fit trackers on location throughout the entire country, or we can work from our branches in London and Surrey. The system works by using GPS satellites for pinpointing the vehicle with an accuracy of around 5 metres, and GPRS technology for transferring the data from the in-vehicle unit to the secure servers. The customer then simply logs in and can view live and historic information about the vehicles, drivers and even the temperatures inside the vehicles. The historic data is kept indefinitely and the user has the ability to set up additional users with various admin rights. A vast range of reports show information such as time, distance, speed, roads travelled on, fuel used and cost etc. Unlimited POIs (points of interest) can be entered for live and historic data.